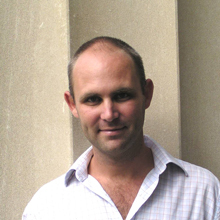 Archaeological Institute of America lecturer and host Steven Ellis (Ph.D., University of Sydney) is a Roman archaeologist who is actively involved in the archaeological research and publication of urban and sacred sites in Italy and Greece. In Italy, Steven directs the Pompeii Archaeological Research Project: Porta Stabia (http://classics.uc.edu/pompeii/) and co-directs the Pompeii Quadriporticus Project (http://www.umass.edu/classics/PQP.htm), while in Greece he is the co-director of the East Isthmia Archaeology Project. A recipient of many international awards, including research grants and fellowships from National Geographic and the Loeb Classical Library Foundation, and with regular appearances on the National Geographic Channel, Steven will soon follow-up his book on The Making of Pompeii: Studies in the history and urban development of an ancient town (2011) with interdisciplinary publications that illustrate the role that non-elites played in the shaping of ancient cities, social habits, and customs in antiquity; and on retailing in the Roman world. An Assistant Professor of Classics at the University of Cincinnati, Steven is internationally regarded as a pioneer in archaeological fieldwork, and his revolutionary use of iPads was singled-out by Steve Jobs and profiled on Apple’s website. He is a member of the Archaeological Institute of America’s Lecture Program Committee and a lecturer on the AIA’s national circuit. As a director of archaeological projects at Pompeii, he regularly addresses travelers visiting Pompeii and the Bay of Naples—groups large and small, ranging from the general public to academics to movie stars. On our cruise from Rome to Venice he plans to address such topics as going 'behind the scenes' in the latest discoveries at Pompeii, Roman journeys through south Italy, how to dig a city, and Dalmatian decadence.